Kept to the basics, this version of the famous Hilton Dust Eater takes away the large Truck Trolley and with it’s own Heavy Duty Drum Trolley allows for a more transportable machine at a cheaper price but still does the exact same fantastic job. A high performance industrial vacuum cleaner with H13 filtration that maintains suction with fine dust. 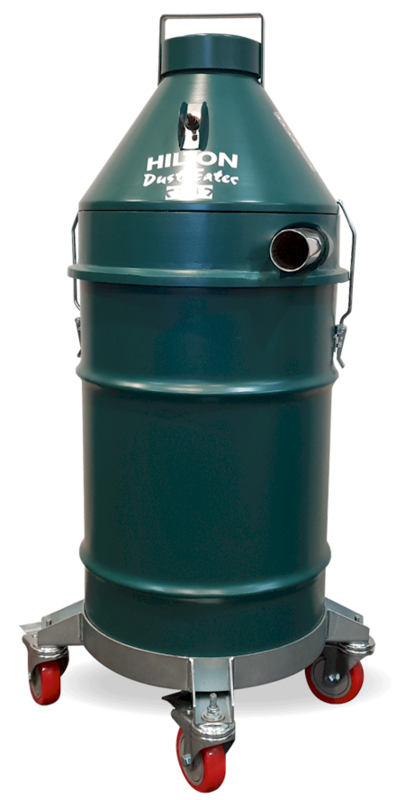 You can enjoy the reliability and simplicity of a cyclonic vacuum system built for managing even the most difficult waste from your production processes. Satisfied customers is what good business is all about and sales of the Hilton Dust Eater Contractor proves this. Proven in many fields of cleaning for over 20 years this icon of vacuum cleaners has it’s early purchasers coming back for more as they see the benefit of such an effective machine that not only does the job superbly but saves time and money through it’s effective and low cost operation. Increased Productivity: Sustained suction, and unsurpassed cleaning capability with fine dusts, filings and other industrial wastes mean less mess, less downtime and a greater focus on your core activities. Advanced A.F.P.T. 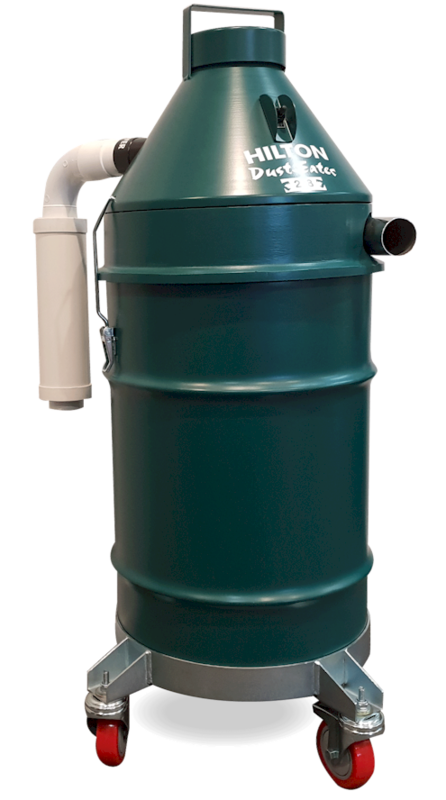 Cyclone: Revolutionary Air Filter Path Technology creates centripetal particle pre-separation in a tuned cyclone. Geometric forces prevent build up and clogging of the with the H13 Filtration Multi-Sock filter section. 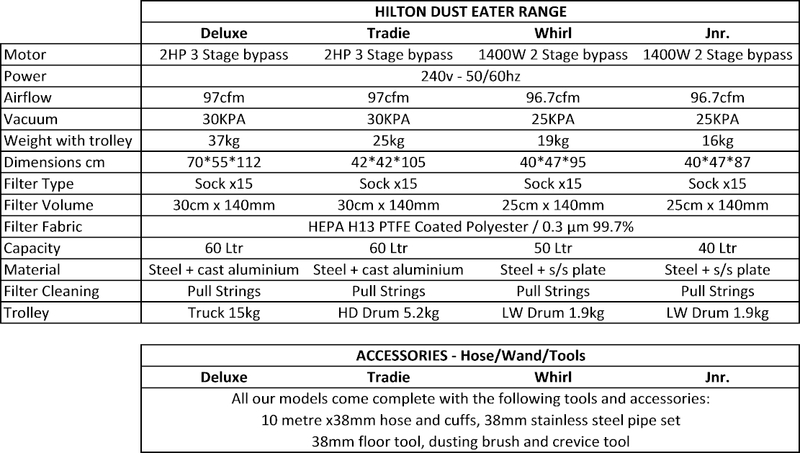 It has come to our attention that there are a couple of ‘Copy Cat’ vacuums suppliers circulating in Australia passing off inferior goods as Hilton Vacuums – Hilton Vacuums can only be purchased through authorised suppliers – if you become aware of these imposters, please call us with details. If you’re a past customer of Hilton Vacuums or Hilton Products, update your details with us here. We’ll add you to our customer email list with monthly specials. …we were sick of vacuums with inconsistent suction, useless filter systems that don’t filter, motors that keep needing to be replaced, and chunky machines that are too awkward to handle between jobs. We tried the Hilton Vacuum and all our old hassles went away. The only problem I have now is the boys fight over using them so I had to keep buying more. Click here to download our Filter & Seal Replacement Guide for the Hilton product range. SPECIAL NOTE – In 2014 our Vacuum cleaner company, Hilton Industrial Vacuums And Engineering Ltd in NZ formed a merger with UK company SMH Ltd. This has been a failed relationship and the company is being dissolved. Moving forward and to maintain a service to all those good customers who bought a HILTON Vacuum we are still able to service and supply parts for all the equipment out there. Recently we’ve launched a new and improved range of vacuums and they are now available. Click here for more information.